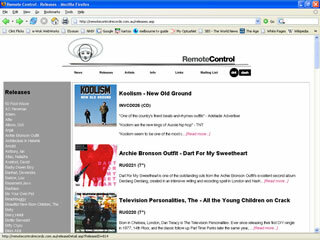 Remote Control Records were the first customer of Media Empire's web design arm, e-Wok, in 2001. They required a cool-looking, dynamic website containing information about their hundreds of artists and releases. The Media Empire design stood them in good stead for over five years as the company grew. When Remote Control Records opened for business, our first meeting was with Warwick Holt @ e-Wok. We envisaged that our website would be an integral business tool providing background information on our company and profiles of the artists we represent. We were looking to create a website that truly projected our image and culture, was user friendly, and above all, was easy for us to maintain. e-Wok was able to achieve this for us quickly & effectively while still working within our budget and time limitations. We now have a site that is fully self-sufficient with the potential to be expanded in the future. Remote Control highly recommends e-Wok as a website designer.